Co-Founder Harrison Goodale's Account of Songscape: Roosevelt National Forest! I’m still recovering from all of the hiking we did all over Roosevelt National Forest. Hiking at altitude is no joke, but the views that you are rewarded with at the top of Stormy Peaks pass, or Cirque Meadows are worth it! I have to say, I was a bit nervous that The Burroughs were not going to want to hike all over the mountains just outside of the CSU Mountain Campus, but they were all for it, and with smiles on their faces. 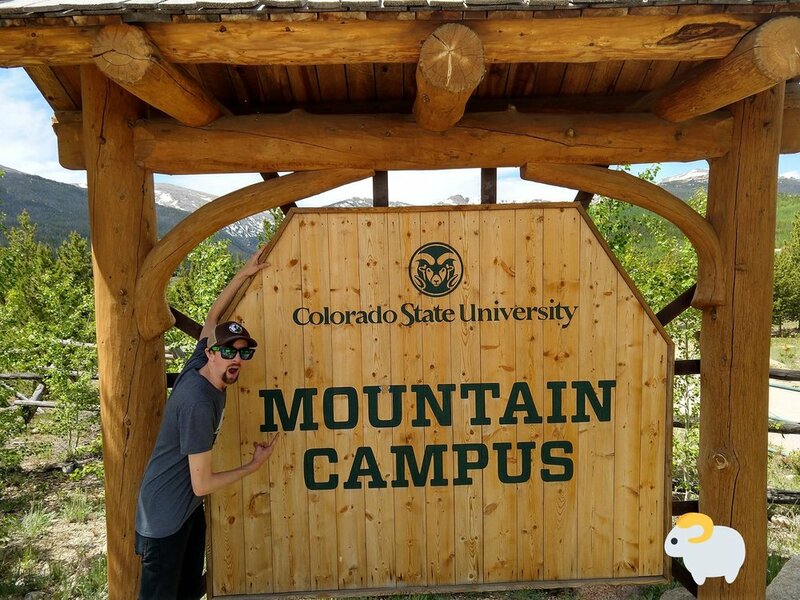 The Burroughs, our 9-piece soul band partners, drove up the 16 mile dirt road from their last gig in Glenwood Springs, CO to our home for the week: Colorado State University's Mountain Campus. They settled into the Cinquefoil bunk house, aptly named as a botanical reminder that we were being hosted by CSU's Warner College of Natural Resources. With cases of donated New Belgium beer in tow, we set up the space in the main lodge and prepared for the Songscape Kick Off Party. Our guests, partners and friends, began to trickle in for dinner, tastily prepared by CSU. They were greeted by the sounds of saxophones, trumpet and funky guitar lines as The Burroughs rehearsed in the next room. After dinner and remarks by Sustain, US Forest Service, and the National Forest Foundation, students and professors on campus were welcomed in to watch the concert and learn a bit about the Songscape program. I can't believe the horn section was managing so well at 9,000 feet! The band looks at bags of hummingbirds, while scientists and volunteers record data (e.g. weight, age, gender). Bri Harris with a broad-tailed hummingbird. The next morning we all arrived early to breakfast to help out with hummingbird banding! The little birds were ferociously diving and buzzing each of the band members, Bri Harris in particular since she was wearing a red. The band was entranced by the delicate care taken to band the fragile little birds, which provides important data on hummingbird populations and migrations . At the end of the banding process, one of the scientists, from the Hummingbird Monitoring Network, placed a hummingbird on to Bri’s outstretched hand in order to release it. The bird sat up, a bit bewildered at its predicament and for about a minute just sat and stared at us. Finally without warning, it took off and zipped into a near tree. It was a magical moment, and I think set the tone for the types of experiences the band would have at this amazing place. Sustain, National Forest Foundation, and The Burroughs having fun! At 9am we met at the lodge for a meet and greet with National Forest Foundation representatives (Spencer Plumb & Sally) for a guided hike up to Stormy Peaks Pass. This hike was 12 miles round-trip, and a challenging one since no one was really acclimated yet! But that didn’t seem to phase the band at all. We headed out up through canopies of quaking aspen, with their leaves shimmering at the slightest breeze. After a few breaks on some particularly challenging ascents, we learned about the history and rules regarding designated Wilderness areas. 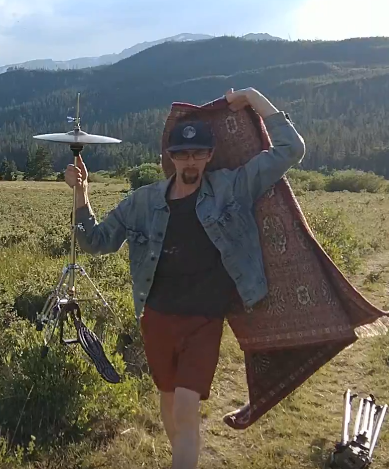 The band took a few goofy promo pictures with Charles, one of our videographers, before we got into the no-film realm of the Comanche Peak Wilderness. It was clear that The Burroughs love to have fun, and are constantly joking around or just laughing, and that’s the type of experience we want to share with our audiences. Hiking and enjoying the Wilderness and National Forest with friends are what's going to keep these lands relevant! We finally made it to a lunch spot, having emerged from tree line to an alpine saddle. We were greeted with a impressive view of a snow covered peak and a view down the valley where the CSU Mountain Campus was located. Sitting among the thousands of wildflowers and busy pollinators, the band and took a much needed rest. Johnny Burroughs however, wanted to see more. So a small group of us booked it an additional 2 miles up to Stormy Peaks Pass and were awed by a view of some of the interior of Rocky Mountain National Park As I turned around to head back, I couldn’t help but notice Johnny running from boulder to boulder in order to get the best views of the mountains. The view from Stormy Peaks Saddle. At the end of the hike we all zoned out for a bit, resting our weary legs and blistered feet. Jason Van Vleet, director of videography and soon to be dubbed Moose hunter extraordinaire, arrived and immediately began grabbing footage. Following dinner, Jason and Charles followed the band out to the CSU meadow where he basically told them to frolic. And in the light of the golden hour, The Burroughs frolicked. I’m pretty sure that’s the first time I’ve heard instructions to frolic, but I’m glad it happened. Ari, Hayden (Burroughs), Marley, Bri (Burroughs), Johnny (Burroughs), Tom, and Alec (Burroughs) at Cirque Meadows in Roosevelt National Forest. It was pretty slow getting up for breakfast-- everyone was sore from the previous day but we managed, and met up with Tom Bates, and his two interns, Marley and Ari, from the U.S. Forest Service. This hike was a bit less strenuous and we stopped at various points whenever Jason saw a particular scene or lighting moment. During these times, Tom, who is a USFS botanist, would talk about the various flowers and mountain vegetation that make areas like Roosevelt National Forest so special. His particular favorite was a small, seemingly unimpressive plant called Moonwort, but once you stopped and took a look you could see that this was a very old species, since the dinosaurs in fact. Tom and his interns had a wealth of information, and The Burroughs made sure to take advantage of their expertise. It was truly inspiring to see the band’s eyes widen or shout in excitement as they saw a new type of flower, or came across a scenic view. More post-dinner golden hour frolics happened for our videographer too. Post 'work', the band made sure to get some time in to practice and by the end they had 14 different songs up on the bunkhouse chalk board! That night from my room I could hear the beginnings of what would become their Songscape song. Videographer Charles Kelly filming a meadow dance off. 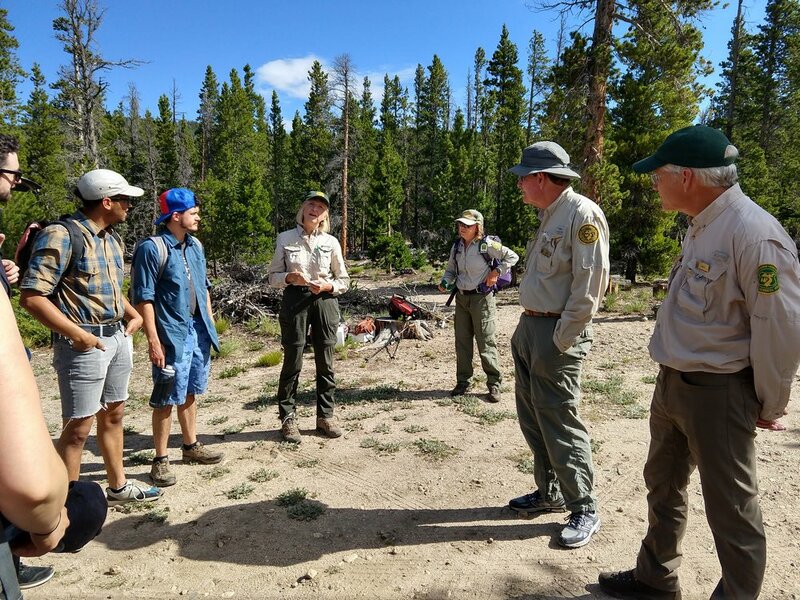 Hitting the trail with the Poudre Wilderness Volunteers! The band was pretty exhausted at this point, and we opted to do a short hike up to a reservoir, which also happened to be the water source for Greeley, CO- their home town. We met up with the Poudre Wilderness Volunteers, and Jess from CSU for a nice 4-mile hike one ridge over from the campus. This hike took us through a lodgepole pine forest, shaded from the sun and it hugged a stream for the majority of the time. On this hike the band learned the importance of community volunteers for trail work and trash clean up, and Leave No Trace principles. The theme for the band this week was the National Forest Foundation’s phrase, “It's All Yours.” And the band was getting the picture! There is so much land to enjoy and so little budget and people to steward them. Its up to the people who use them to help care for them! Get ready to go flying across a river. After our hike the band spent the rest of the afternoon on the CSU zipline- through a rain shower illuminated by the setting sun, and a bonfire where the band played sing-along tunes late into the night. We were also pleasantly serenaded by the rough draft of the Songscape song as the fire started to die down. After thoroughly dousing the fire we all went out to the homestead field and lay down on the ground looking up at the stars. It wasn’t hard to imagine that a hundred years ago others probably were doing the same thing. Our last day for Songscape: Roosevelt National Forest, and it happened to be America's birthday, July 4th. Though everyone was exhausted from our ~22 miles of hiking, no one wanted to leave! Before The Burrough's headed out to their next gig in Evergreen, Colorado, we all made sure to take one last look at the iconic Mummy Range surrounding our temporary mountain home. "I want that view tattooed to the inside of my eyelids," quipped one of the bandmates. These public lands are treasures and one of the best things about being American. The Burroughs, with Roosevelt National Forest in the background. Credit: Charles Kelly. Older PostSustainer's Party in Fort Collins!